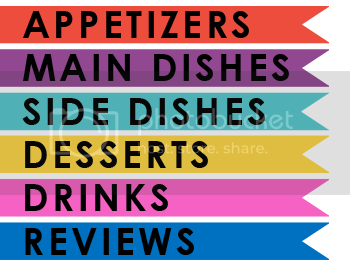 Hey Foodie Friends! I guess I should start by saying happy March?! I don't know how that actually happened, but somehow it did. Today's post is classic Warren. I love things that are simple, nostalgic and have a good story. 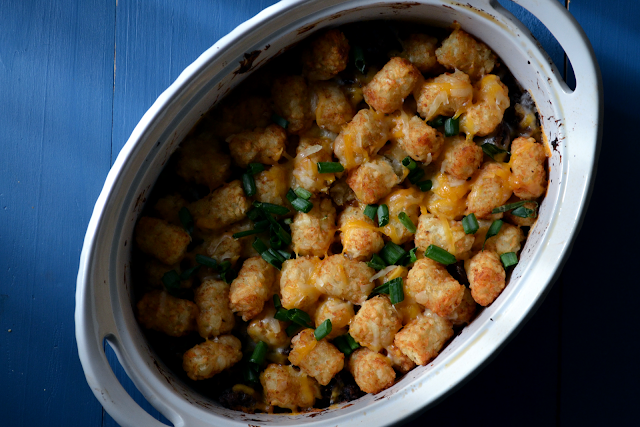 Tater Tot Casserole is something that we had quite a bit growing up. 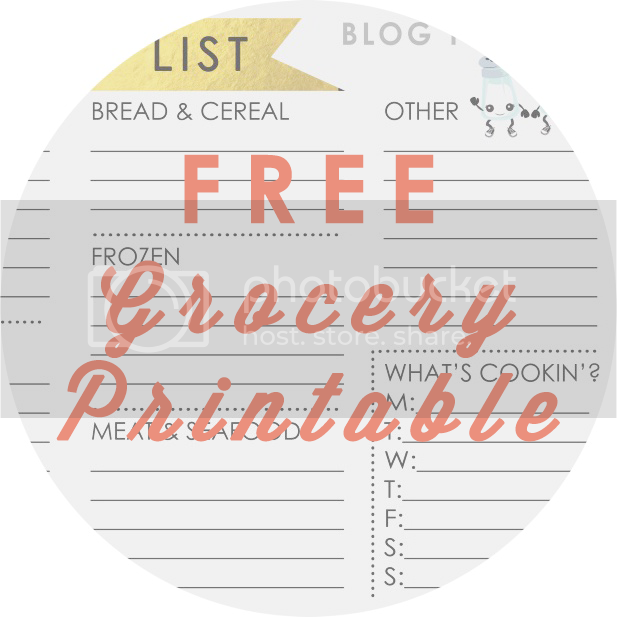 With two full-time working parents, meals in our house were always what was easiest for my mom: spaghetti, hamburger helper, meatloaf, chicken alfredo and casseroles of any kind. Tater Tot Casserole was a favorite for my brother and I. We LOVED it. 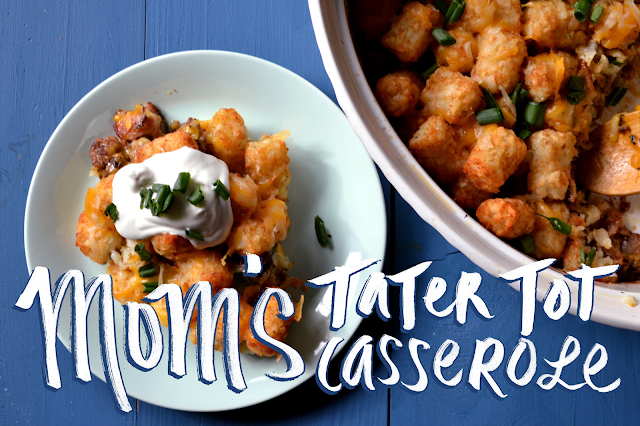 I was talking to Holly about Tater Tot Casserole recently, and she had never heard of it! EXCUSE ME?! She also immediately had a million concerns, with the number one being that the tater tots would be soggy and gross. I had to make it, share it with you, and share it with her. I am sure she's going to love this post. I love this recipe because it's so easy! If I wasn't taking pictures and notes while making this, the prep time would have taken probably less than 20 minutes. This was always what my mom was looking for, quick and easy meals. Pre-heat the oven to 425˚. 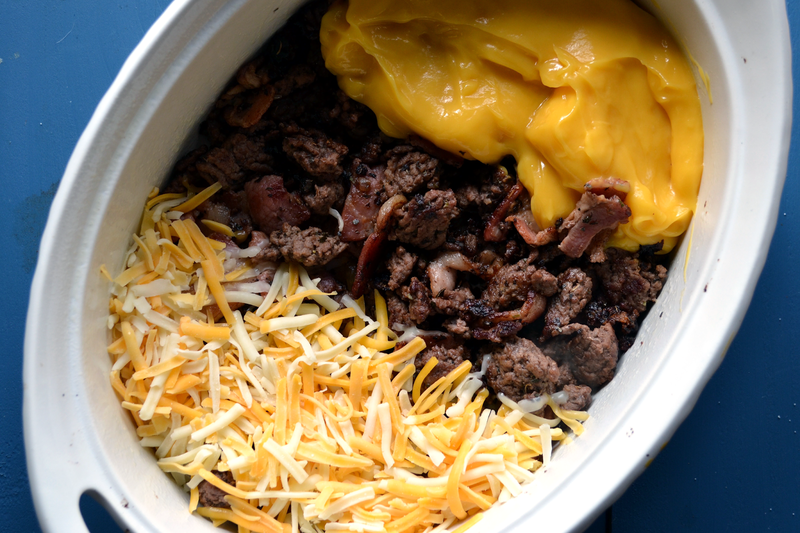 Start by browning the cubed bacon and ground beef. Once browned, add the sweet onion minced up. Cook for another few minutes. I'm not a big fan of onion, but for some reason this is absolutely required for this recipe. Add the browned meat and onion into a oven safe dish. I then added in the shredded cheese and the cheddar cheese soup. To be honest, my mom always used cream of mushroom soup, and I'm sure if you ever had this at home that's probably what you had too. However, CoM was my arch nemesis, and nothing has changed. Feel free to use it if you'd like. 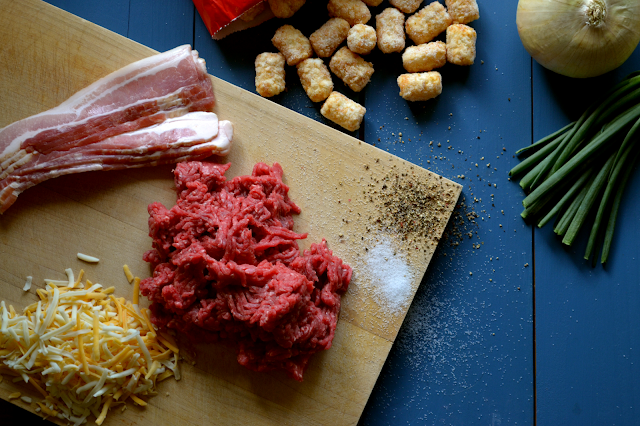 Mix it all together in the dish, and then top with tater tots. Put in the oven and bake for 45 minutes uncovered. This is how the tots cook and get crispy without getting "mushy" as Holly was concerned with. Once baked, serve with sour cream or ketchup if you're like me. This recipe was such a staple in our house growing up, and after going for years without it, I have to say, it's going back in rotation! I love how simple, quick and delicious it is. What is one meal that sticks out to you from childhood?